Dr James McGrath’s book Naming Adult Autism: Culture, Science, Identity is published in paperback in spring 2019 by Rowman & Littlefield International. The book explores portrayals of adult autism in novels (by E. M. Forster; Douglas Coupland; Margaret Atwood), poetry (Les Murray; Joanne Limburg) TV (The Office; The Bridge) and popular music (The Who’s Tommy). Naming Adult Autism also applies literary critical approaches to key scientific texts surrounding autism. Through this technique, the book uncovers a series of scientific flaws in major questionnaires and research papers. The chapters argue that in order for academic knowledge of autism to meaningfully advance, there needs to be greater dialogue between the sciences and humanities. James is a Lecturer in English Literature and Creative Writing at Leeds Beckett University. He is currently working on a second book. Titled an autistic figuration, this is a set of poems using constraints. an autistic figuration is the sequel to a chapter titled ‘Autism and the Machine’ in Naming Adult Autism. In spring 2019, James has given readings of his new poems at the Flock Festival (Leeds) and the Huddersfield Literature Festival. 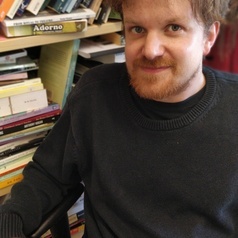 Previously, his poems have been published in PN Review, Smiths Knoll, DreamCatcher, Guardian Higher, The Interpreter’s House, Shadowtrain and International Times.